Although our focus is on wireline transmission and connectivity, we can’t ignore in-building communication. Wireless local area networks will continue to dominate in-building communications and in this article, we look at the higher frequency of 60GHz and higher speed wireless technology. We will also list two of the leading vendor products based on this technology. The need for higher speed in-building networking cannot be overstated. Because of the prevalence of Internet of everything (well, almost everything), the use of Ethernet LANS alone, even for businesses, has long since been declared untenable. In our most popular article of 2016 – 5GHz Wireless Networking for Modern Homes, we looked at how 5GHz Wi-Fi was augmenting 2.4GHz. 2.4GHz speed was falling too short of the speed required inside homes and offices. Moreover, 2.4 GHz was subject to excessive interference from neighboring devices and a growing number of devices operating at the same frequency. Although it has been less than three years since we shared these insights, both 2.4GHz and 5GHz will no longer meet tomorrow’s local area wireless networking requirements. They both need an additional solution to rescue them and this is where 60GHz comes in. The Wireless Gigabit Alliance (or WiGig), an industry consortium, initially spearheaded the development and promotion of wireless communications around the 60GHz frequency band starting as early as 2007. The motive was to develop wireless technology with enough bandwidth to replace wireline local area networks in the home and office. Moreover, they intended to wirelessly connect computing devices to computer monitors. In 2013, WiGig merged with the Wi-Fi Alliance, a more established organization. Of the unlicensed frequency bands available, 60GHz carries higher data rates of multiple Gbps. The current version of WiGig technology, which complies with the Institute of Electrical and Electronics Engineers standard IEEE 802.11ad, enables devices to transmit a maximum of 7–8 Gbps data rates. Upcoming versions of the technology are expected to transmit even higher data rates of 10 Gbps. Unfortunately, the WiGig technology impressive speeds come with a caveat. The coverage distance is severely limited to only about 10m (~33ft). This is typical of electromagnetic communication in free space, the higher the frequency bandwidth, the higher the information carrying capacity but the lower the reach. As if this was not bothersome enough, the high frequency of 60GHz cannot penetrate walls. Thus, a 60GHz wireless router cannot be accessed from multiple rooms. However, enhancements are in the works to develop the technology that can at least boost transmission range of up to 500m (and even higher speed) in a newer standard (IEEE 802.11ay) expected soon. A few providers already have IEEE 802.11ad wireless routers on the market and they are all tri-band. In contrast to the dual band Wi-Fi routers discussed in our previous article that included 2.4GHz and 5GHz frequency bands, the new tri-band routers also include the 60GHz band. A user typically locates the router in a room in which the highest bandwidth is required. The 60GHz is used in the room with the router while 2.4GHz and 5GHz are used in areas that do not have a direct line of site with the router. While almost all the providers advertise the speed of their routers as 7.2 Gbps, they add the speed of each frequency band to come up with this value. The actual highest speed at 60GHz is 4.6 Gbps. The data rate is common for all providers who are so far offering these routers because they all get their chipsets from Qualcom. Qualcom’s chipsets are specified as 4.6 Gbps although the maximum standard specification is 7-8 Gbps. 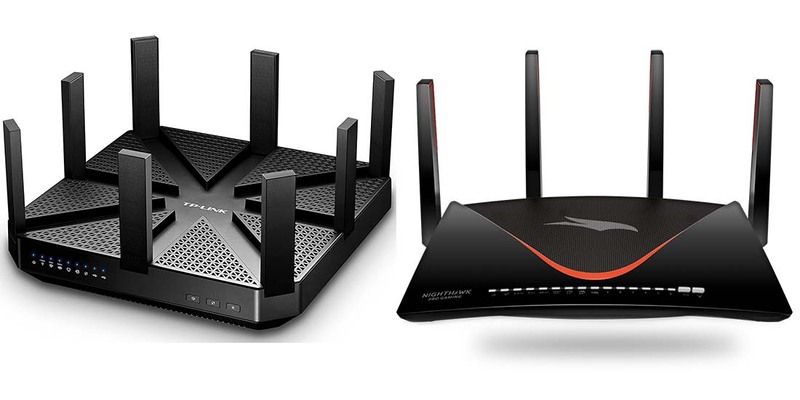 Two of the leading IEEE 802.11ad routers on the market are TP-Link AD7200 and Netgear Nighthawk XR700. Click on the images below to see product and pricing details at Amazon. Click on the image to see more specifications and pricing at Amazon.